Featuring a quick-disconnect hub and turn signals, the new 30” collapsible motorsports column from Flaming River boasts a lightweight design made with precision tolerances to ensure positive steering input. The column is made from 304 stainless steel, with a diamond laser-cut collapsible feature to add safely in case of frontal collision. Internal electronics operate turn signals, four-way flashers, and horn. Meets SFI-Spec 42.1 requirements with a NASCAR-required steel pull-disconnect ring. Available in custom lengths in a black powdercoat or in paintable mill. 30” motorsports column with collapsible feature. Turn signals, flashers, and horn. Available in paintable mill or with a black powdercoat. Custom lengths available (use P/N: FR3310LCXX). The new PROFORM 160-amp CS130 alternator has a one-wire internal voltage regulator that uses a low-idle cut-in for charging at low RPMs. 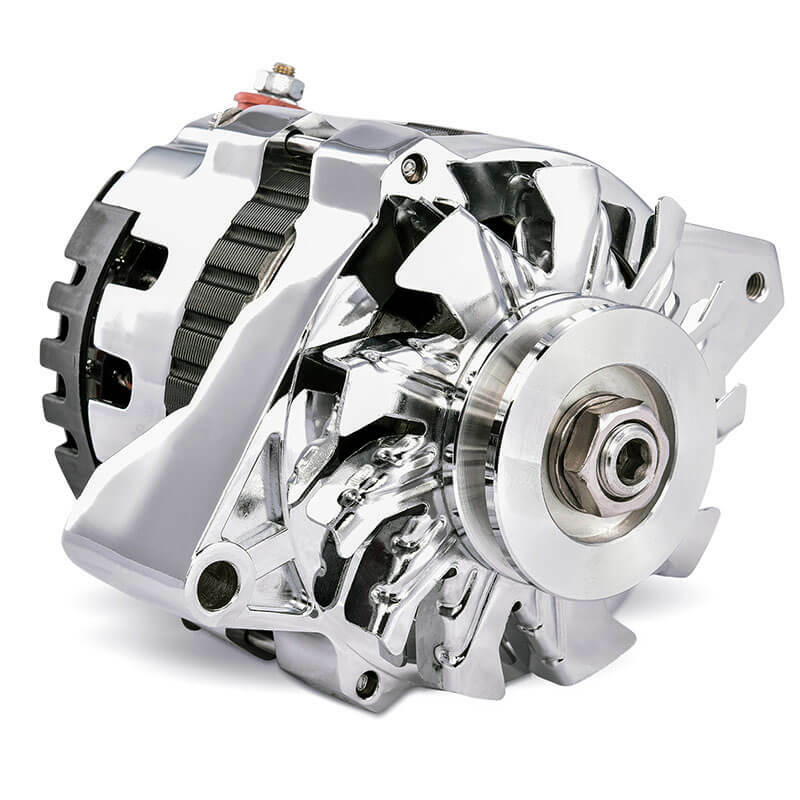 The finned rear housing allows for better cooling and longer life, and with a higher amperage output per pound than its predecessor (the popular 10si style), this alternator is perfect for anyone running additional electronic accessories. Applications available for SBC 305-350 and BBC 402-454 V8 engines in either a Satin (66430.16N) or Chrome (66430.16C) finish. As with all PROFORM alternators, it is made with all-new components on specialized machines and assembled by trained personnel using dedicated jigs and equipment. For small block 305-350 and big block 402-454 V8 Chevy engines. 160-amp, CS130 GM body style. 1-wire hookup with internal regulator and machined pulley. Provides charging at low RPMs. internal voltage regulator that uses a low-idle cut-in for charging at low RPMs. 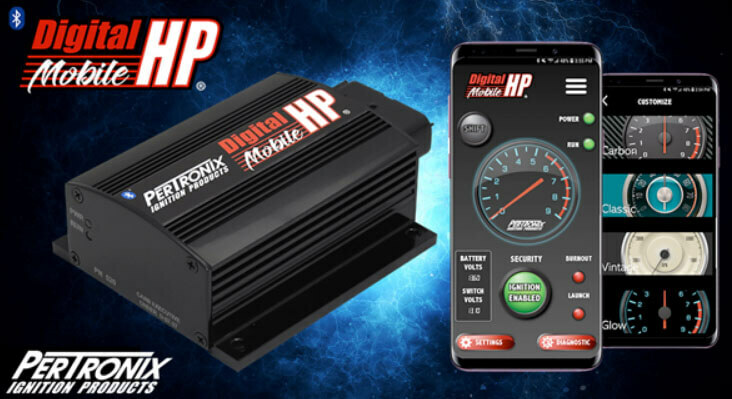 Now available from PerTronix is an app-controlled version of the company’s hit Digital HP ignition box. The Digital HP Mobile CD ignition system (P/N 520) can be controlled via Bluetooth using an exclusive PerTronix mobile app (search for “Digital HP Mobile” in the Android or Apple app store). The Digital HP Mobile CD ignition box’s wireless interface gives you programming access to the system’s many features, including setting up to three rev limits, shift light, start retard, spark settings, and tach preferences. PerTronix has included the ability to save and load multiple settings for quick changes between street and strip modes, while preloaded, user-selectable themes let you establish your preferred look and feel. Adjustable start retard for high-compression engines. Programmable engine over rev limit, launch limit, and burnout limit. Real time digital dashboard displays tachometer with rev limit indicator, integrated shift light, two voltage displays, security selection button, and burnout and launch limit indicators. Multiple power settings and adjustable shift light output. Set and save all settings. Ignition kill switch, one-touch valet mode, and ignition diagnostics. Dashboard themes for a personalized look and feel. Updatable firmware to keep your system up to date. Thanks to Flex-A-Lite, better cooling is in sight for owners of 2003–2007 Ford F-250/F-350 Super Duty pickups with 6.0L Power Stroke Turbodiesel engines. The 315360 system, which comes with dual electric fans, replaces the factory belt-driven clutch fan and shroud to deliver more engine power to the wheels and better fuel economy. It also allows for faster engine warm-up and improves A/C performance at idle and slow speeds. The future of performance aluminum radiators includes a variable-speed, adjustable thermostatic controller, moves 6,000 cfm of airflow, and provides better heat transfer—all thanks to the extruded-tube design, which replaces outdated single-, two-, three-, and four-core configurations. The Flex-A-Lite 315360 radiator/fan combo achieves this performance along with more durability (100 psi burst rating) and less weight. Applications (including LS swap) available for muscle cars, pickups, and Jeep. Also available without a fan (315300). Increased contact between coolant and aluminum tubes—and tubes and fins—for better heat rejection and cooling. Redesigned cooling fins also contribute to improved heat rejection and cooling—wind tunnel tested! Corner subhead reinforces the cooling tube–to–header connection, an area prone to cracking and leaking in other brands of aluminum radiators. 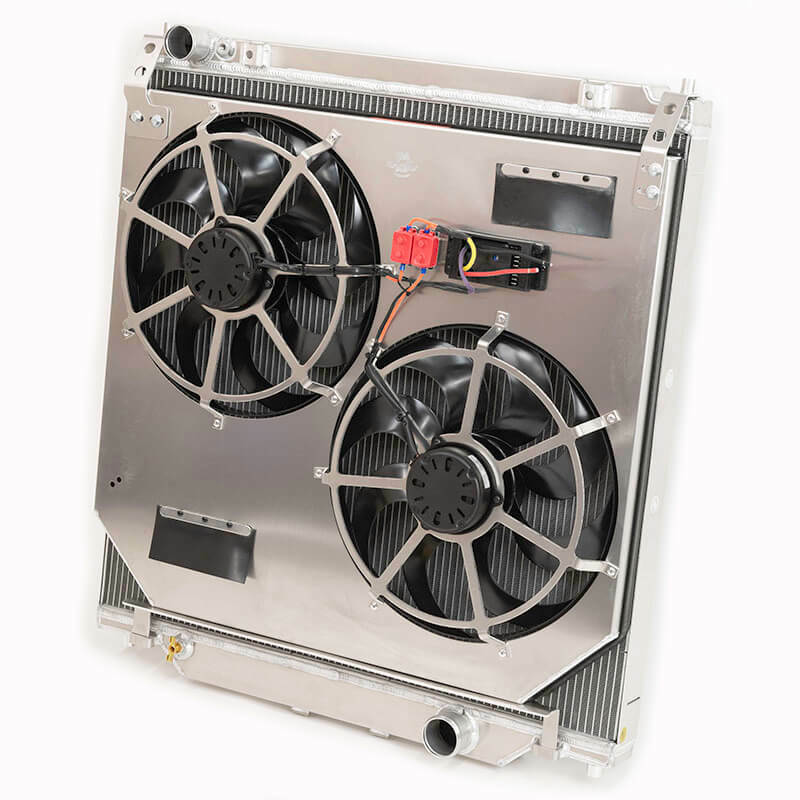 Available with (315360) and without (315300) dual electric fans.